Goodgear can supply custom made sublimated uniforms for sports clubs, school uniforms and corporate business uniforms on the Central Coast. We supply sport clubs with team uniforms and merchandise including sublimated jerseys, training polos and training shirts, shorts and socks. Goodgear can also supply promotional products branded with your logo, team name, school emblem or corporate brand with full colour sublimation, printing or embroidery. 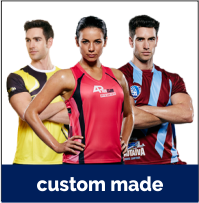 Goodgear can custom design uniforms with full colour sublimation, printing or embroidery to make your sports club stand out. We currently provide uniforms and promotional products for football clubs, rugby teams, netball uniforms, athletic clubs, surf clubs, cricket teams, basketball teams, dancing and gymnastic schools, aswell as school uniforms and workwear for hi vis industrial and corporate business. Goodgear supplies workwear and corporate business uniforms locally on the Central Coast, Newcastle, Hunter Valley and Sydney regions. Our popular brands include Biz Collection, Aussie Pacific, Bocini, King Gee, Bisley, DNC, Gildan, Gear For Life, JB's Wear, Legend and Stencil. Goodgear has been supplying work uniforms across Australia for over 35years. We are located in West Gosford, Central Coast, NSW. We service business's with uniforms and promo products in and around Gosford, Erina, Tuggerah, Wyong, Newcastle and Sydney. We have a showroom that you can visit to view our workwear and promotional products. We also have a brick and mortar retail store at East Gosford called Workwear Express. The experienced team can assist with uniform fittings and explain the order process for custom made and stock uniform orders with your logo embroidered or printed.